Frenchman Mathieu Baudry has passed on some wise words from his father as the alarm bells threaten to ring at Doncaster Rovers. 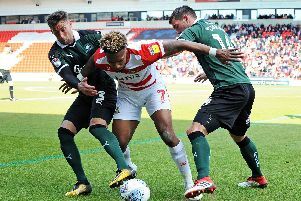 Having not won since the turn of the year, tomorrow’s home clash with Fleetwood Town was an important one even before Tuesday night’s abject defeat at Walsall. Now the pressure has been ramped up a notch, Baudry says his teammates must be brave and not go missing in what could be a tense affair against the Cod Army. “Every one of us needs to take responsibility, to step up and be counted,” said Baudry, who could return to the starting line-up following a hamstring problem. “When you haven’t got the results and confidence drops a little bit, that’s when you need to step up. You need character. “Sometimes when things aren’t going right maybe [players] can start hiding, you’re not too sure, you don’t really want it [the ball]. If you don’t want the ball that just makes things harder. “My dad always says ‘fear didn’t stop danger’. If you’re worried about making mistakes that doesn’t mean you’re not going to make any. If anything, you’ll make more. Baudry rejects the idea that complacency may have crept in prior to Tuesday’s 4-2 reverse. “I don’t think so,” he said. “If so, we probably would’ve played with more freedom. “I think a few bad results might’ve affected us. We’ve drawn so many games and it’s frustrating. “You’re not losing but you’re not going up the table as you would like to. But there’s no point looking at the table or looking at the results. We’ve just got to focus on what we have to do on the pitch. “If you tense up because of anything you’re not going to be at your best. “It’s not so much a win we need, I think we need to go back to a good performance, to play the way we can play. “Obviously a win would make a big difference. If you haven’t played that well you always feel like you’ve played better if you get the win.